Winter melon (white gourd 冬瓜) is commonly used in Chinese home cooking. Even though the taste of winter melon itself is not sweet at all but a bit dull, many Chinese families like to use it as it helps to cleanse our body heat. If winter melon is cooked with Chinese mushrooms and some meat, it absorbs all the flavours and tastes wonderful. Here’s a quick winter melon soup, very suitable in summers. Many of my readers might have known that I am living down under. This photo was taken when I cooked the soup here in summer. Rinse mushrooms. Soak them in some water until softened. Drain and dry well, cut into dices. Reserve the soaking water. Peel winter melon and cut into cubes. Marinate pork with seasoning for 10 to 15 minutes. Prepare some boiling water. Heat oil in a frypan. Sauté ginger until aromatic. Add mushrooms and stir fry for a while. Toss in diced winter melon. Add chicken stock and the soaking water, with some more boiling water to your preference. Bring to a boil. Add marinated pork and continue to cook for another 10 minutes. Season with salt. Turn off heat. Stir in beaten egg. Enjoy! i will share this dish with my chinese friend. It's a well known soup. 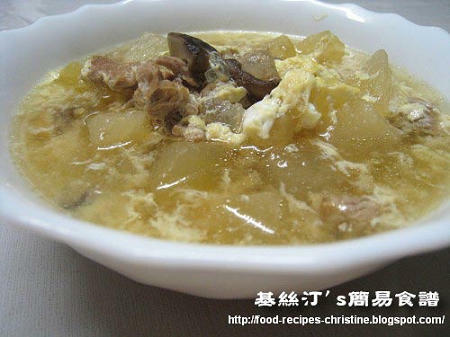 I have published a similar recipe myself, the pork and winter melon soup. If you could get some, that'll be great. Very delicious soup! Hope your Chinese friend likes it. Indeed, many people like this soup, esp. in summers. I miss all these home-cooked soups, my grandma used to cook us soup everyday! You're blessed. You've got someone cook for you. Just visited your blog again. Hope you'll find a way to solve the commenting problem. I made this soup in a huge pot so increased my ingredients and it turned out delicious!